Dear parents, are you having a hard time coping with today’s evolving and troublesome teen text language? Do you know the meaning of text terms used every day, like omw or g2g? Well, some of those you might already know, but most of us, including teens, don’t know 95% of the rest of the chat terms out there. Well not to worry, we have a great quiz app that we would like to recommend to you today. 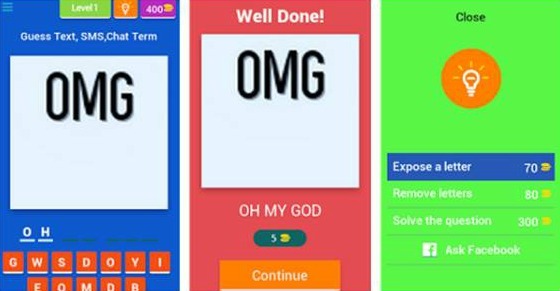 Texting Code Quiz is a fun and exciting quiz app that makes keeping up with today’s youth really easy and entertaining. The quiz itself is pretty straightforward and you can easily start to get the hang of things pretty quickly. It gives you an image of the term, and all you have to do is pick the answer that you think is correct from a pool of letters located at the bottom of the screen. There are also hints to help you along the way if you’re really unsure of what a certain term means. All in all this app is an amazing game in of itself, and it’s sure to give you tons of entertainment. So what are you waiting for guys? Get this cool quiz app and keep up with staying cool and trendy like the rest of our great modern society! You can find and download this free game on Google Play.